Our Vision: Create a culture that encourages a healthier and sustainable lifestyle which engenders a positive impact on the world around us, leading to a movement of compassion impacting our team, customers and community. We're committed to using our business as a force for good, social and environmental responsibility are integrated into all aspects of our workplace. Committed to ethical business practices, we offer a positive, flexible environment that encourages creativity and lifelong learning. We pay it forward by volunteering our time and donating resources to local charities we support. When we inspire our clients with these values and the joy of making consumer choices that have a positive impact on the world, we’re succeeding. B Corporations are leaders of the global movement of people using business as a force for good.TM There are over 2,326 Certified B Corporations from more than 130 industries in 50+ countries with 1 unifying goal – to redefine success in business. 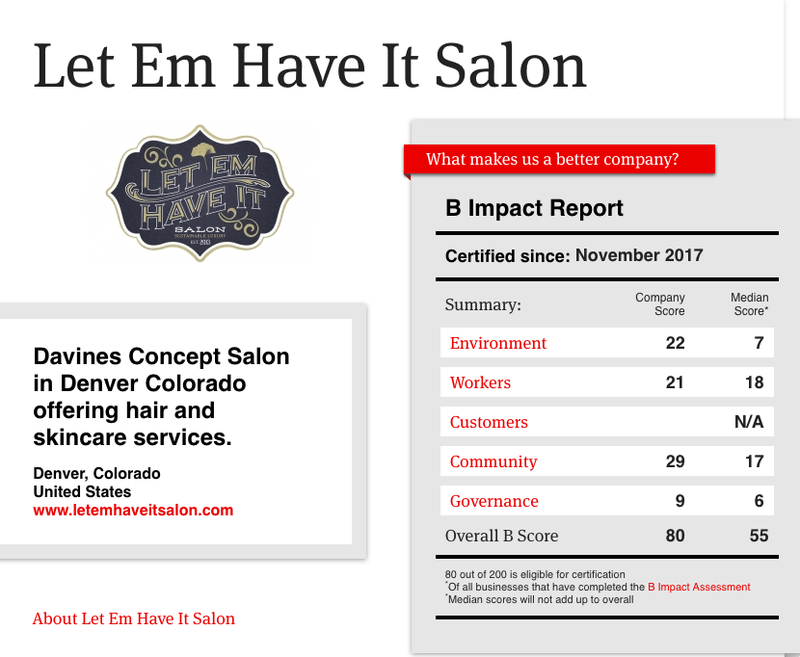 We're the 2nd salon in North America to become a B Corporation! We care about you, and it shows in the details. All of our products are cruelty free and use high quality natural and certified organic ingredients. We ensure that you are getting the best possible service by providing ongoing training, mentoring and quarterly performance reviews. We take our customer feedback to heart and we are alway looking for ways to improve your service and elevate your experience. When you stop learning you stop growing! We're passionate about continuing to develop our skills through advanced education to provide our guests with the best service. We offer 4 advanced classes per year and have developed a 7 month apprenticeship for new talent. 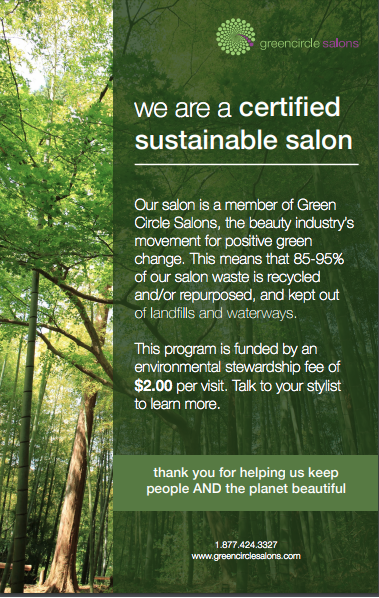 Over 400,000 lbs of waste goes into the landfill every day with US and Canadian salons combined. 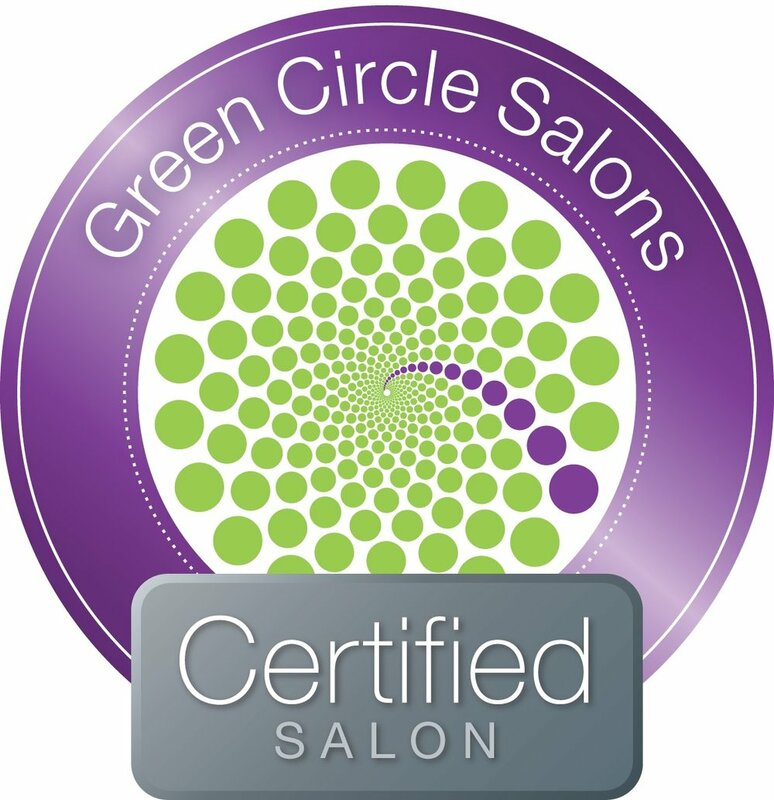 As a Green Circle Salon & Spa we have the ability to divert all of our salon and spa waste, in addition to recycling local and composting through Mile High Scraps. We're proud to throw away only .1lbs of waste in the landfill per week! We've partnered with Arcadia Power and Ecoheads to become 100% wind powered, use solar and conserve water. We offset our carbon foot print by partnering with Tree Era to plant 500 trees per year! We’re proud to be an exclusive salon for Davines Haircare products that are sustainable with biodegradable packaging. Bring in used containers of select shampoo and conditioner and get 15% off your products. Get 15% off Refill Station: Shampoo & Conditioners: Minu, Nounou, Love, Oi, Your Hair Assistant. Supporting and promoting small business helps build a stronger community and economy. We search the globe for product companies that give back and that are aligned with our values. 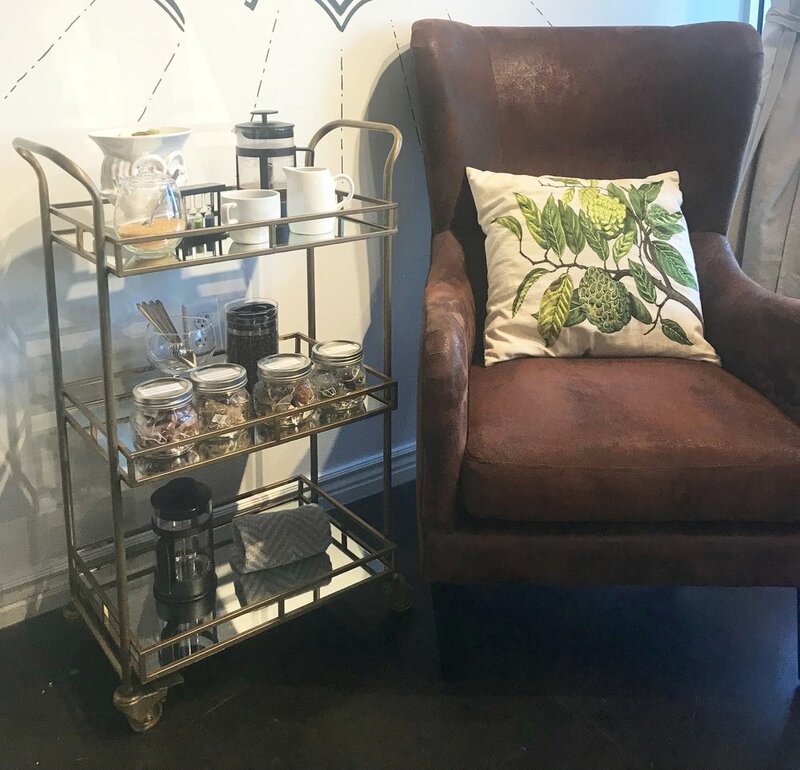 Refreshments that Give Back: We provide a variety of refreshments that are not only organic, they're fair trade, B Corporations and or support local sustainable farms. Volunteering: We volunteer for community events outside the salon. In addition we make monthly monetary contributions to Tree Era to offset our carbon foot print by planting 500 trees per year. Lightly used/unused hair products, new toiletries for Denver Rescue Mission or CWEE. Pet supplies, toys or food for Maxfund. We’ve partnered with a local art college, RMCAD (Rocky Mountain of Art & Design) to feature up and coming artists. Students and local artists have the opportunity to showcase and sell their work for 3 months.